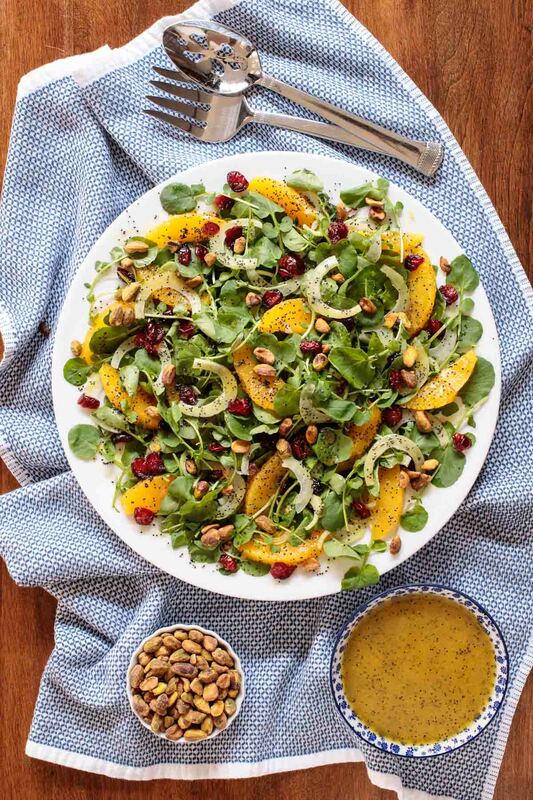 This Orange Fennel Watercress Salad with Lemon Ginger Poppyseed Dressing is a heavenly combination of fresh, beautiful, seasonal ingredients! 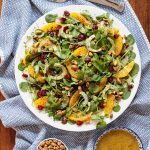 As I wrote the above description of this Orange Fennel Watercress Salad I thought about how the combination of sweet juicy oranges and crisp, thin-sliced fennel is truly a match made in heaven. Although I love both oranges and fennel on their own, a pairing of the two is so much more than the sum of its parts! I’ve been serving versions of this Orange Fennel Watercress Salad for several weeks now, always to comments like “such a good salad!”, “I love this salad!”, and/or “what a beautiful salad!”. It’s been so well loved and pairs so beautifully with a myriad of entrees and cuisines, I thought it was time to share it with you! Watercress is a delicious, dark leafy green that’s actually (like the name says) grown in water. It’s actually been recently touted as a “superfood” because it’s loaded with wonderful nutrients. So many great nutrients that the Center for Disease Control did a study to determine “powerhouse” fruits and vegetables. They were looking for the fruits and vegetables most strongly associated with reducing the risk of chronic disease. Each of the fruits, veggies, greens, etc. was given a NDS (Nutrient Density Score). The highest NDS possible was 100. Guess what? Only one food was assigned a perfect score: watercress. If that wasn’t enough, watercress is also a whimsically beautiful green. With pretty round leaves in different sizes and long curved stems, it makes a lovely salad. The flavor of watercress is a little “peppery” with some similarity to arugula, although it’s crisper and a little sweeter. I love that it keeps better than many other greens. 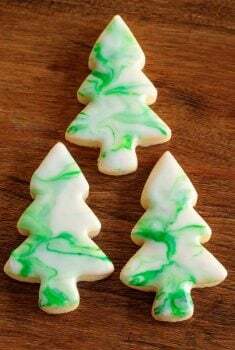 I can have a bag or bunch of it in my refrigerator for several days without it getting limp and “slimy” like so many other greens. Watercress used to be difficult to find but more and more grocers are stocking it these days. We live in a small (really small) mountain town outside of Asheville and I was thrilled to find our local grocery store is now carrying watercress regularly. I’ve even found it at Super Walmart! If you can’t find watercress ask the produce manager at your grocery store. They can, most likely, get it but might not realize that it could be a well-received produce option. What’s a good substitute for Watercress? That being said, watercress is more likely to be found during the winter and early spring. It doesn’t care for hot weather, so it won’t be easy to find in the summer months. 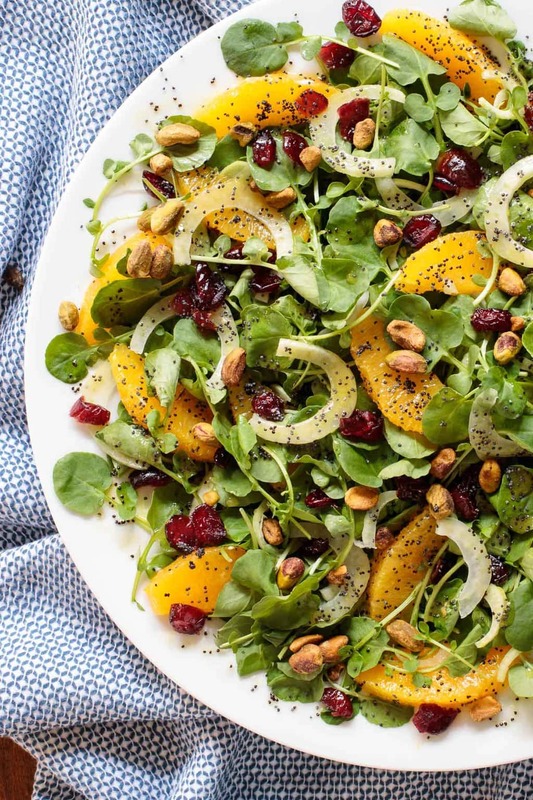 Arugula could definitely be substituted for watercress in this salad with delicious results; as could baby kale, torn butter lettuce or Bib lettuce. I mentioned above that I’ve been serving “versions” of this salad over the past few weeks. It’s a wonderfully adaptable salad and you can definitely add other seasonal ingredients. I’ve included avocado slices, slivered red onion, pickled red onion, pomegranate arils and even sliced winter strawberries. A combination of blood or Cara Cara oranges and navel oranges would also be lovely. Not familiar with fennel? Fennel is actually a member of the carrot family. You’ve probably seen it in the produce section but might not have known what it is or what to do with it. Fennel is a pale green bulb that’s attached to a stalk that resembles celery. At the top of the stalk are wispy, dill-like greens, called fronds. All parts of fennel (including seeds, which can be purchased and used separately) can be used in cooking, although it’s the bottom “bulb” that you’ll want to use in this salad. Fennel also has lots of nutritional benefits. It’s high in Vitamins C and A, fiber and potassium. It’s also low in calories and has high antioxidant properties. There’s been research done to show that fennel may help prevent cancer. Fennel has a sweet, fresh and bright flavor that been described as having hints of “licorice” or “anise”. While this is true, I love fennel but am not particularly fond of the flavors of licorice or anise, so it must be pretty mild. 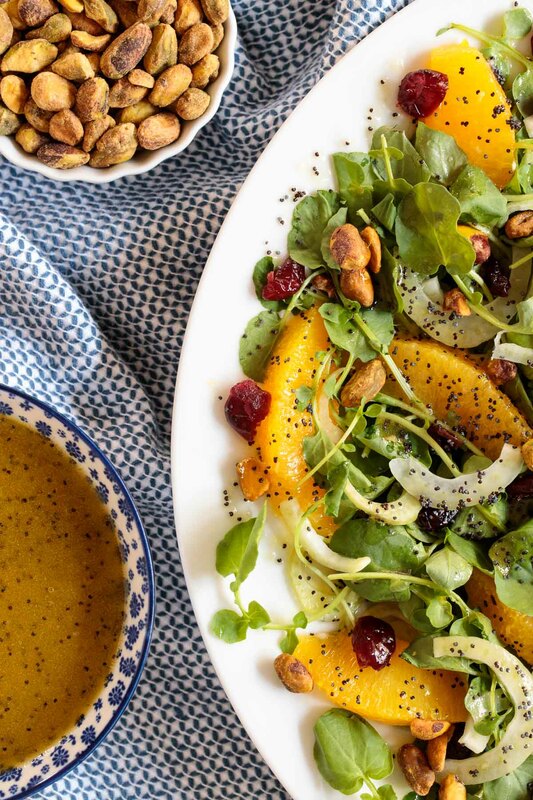 To tie all the lovely flavors together in this Orange Fennel Watercress Salad, I went with this bright, fresh-flavored Lemon Ginger Poppyseed Dressing. 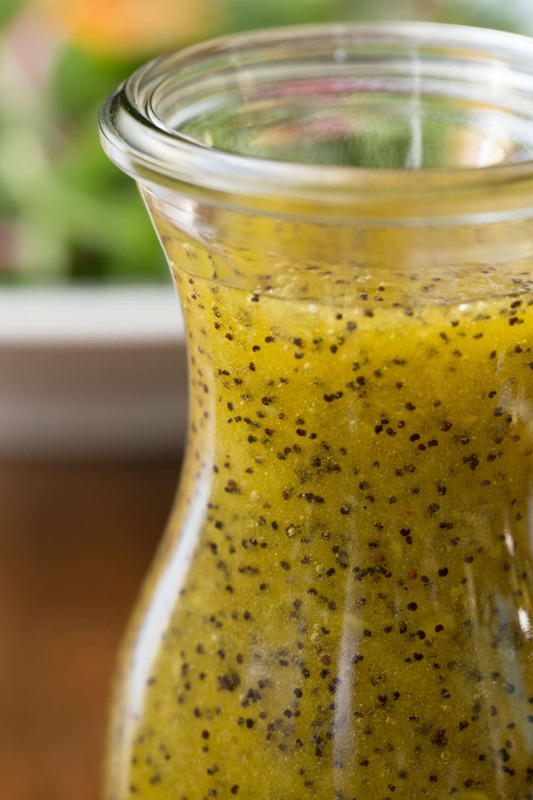 With fresh lemon juice, honey, olive oil and finely grated fresh ginger, this dressing is a delicious jar of liquid sunshine for your salad! It’s one of those super easy throw-it-all-in-a-jar-and-shake dressings that takes minutes to put together. I love having a jar of it stashed in the fridge so anytime I want to throw together this wonderful Orange Fennel Watercress Salad, it’s a breeze! Make this salad ASAP! I think you’ll find yourself loving it and serving it as much as I have. Bon Appetit! If you can’t find watercress, arugula, baby kale or butter lettuce is delicious in this salad. 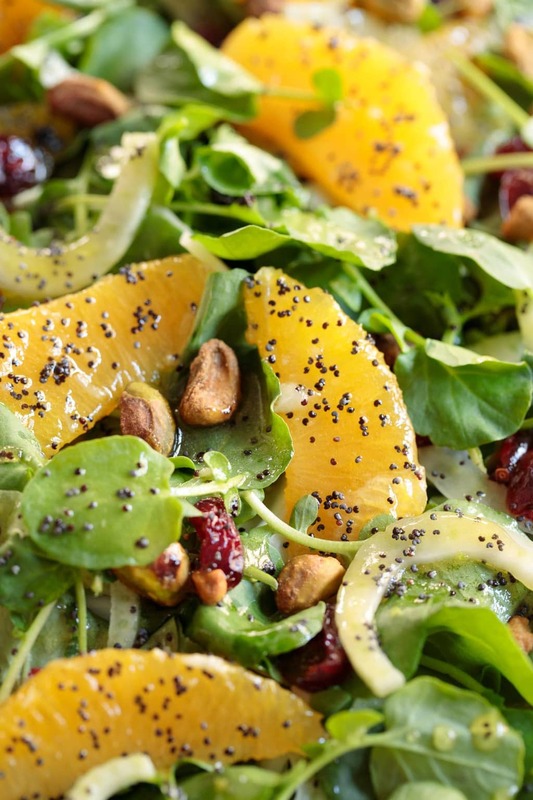 The oranges in this salad can be cut in a variety of ways. I’ve peeled and diced them, halved and sliced them and also cut out the segments as shown in the pictures of this Orange Fennel Watercress Salad above. This recipe calls for roasted, salted pistachios. Roasted, salted cashews are also delicious, as are roasted peanuts. 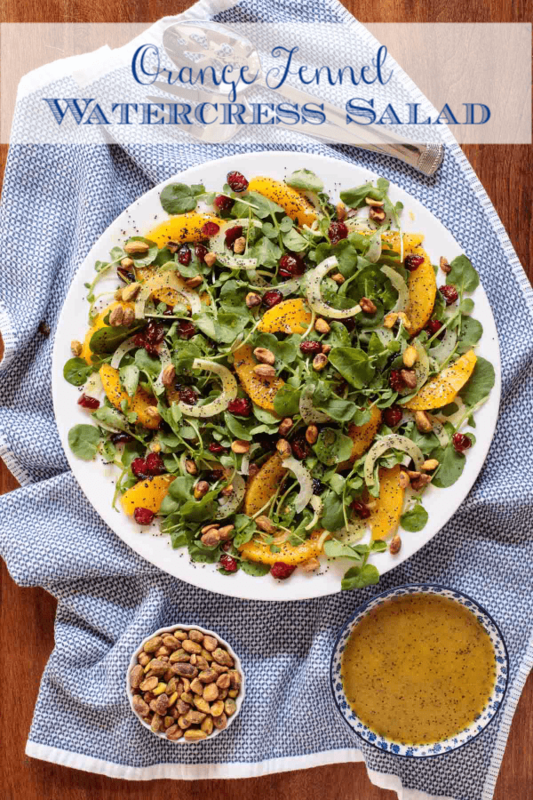 The Lemon Ginger Poppyseed Dressing recipe will make more than you need for this Orange Fennel Watercress Salad, but it goes well on lots of other salads too. It will last for at least a week to 10 days in the refrigerator. I like to keep a tube of Ginger Paste in my refrigerator or freezer so I always have fresh ginger on hand. Ginger paste is available in the produce section of many larger grocery stores and big box stores like Super Walmart. You can also order Ginger Paste online. The entire fennel bulb is edible, but the core can be a little tough. When you cut a fennel bulb in half, you’ll see a small V-shaped core at the bottom. To remove the core, just slice this V out and use the rest. 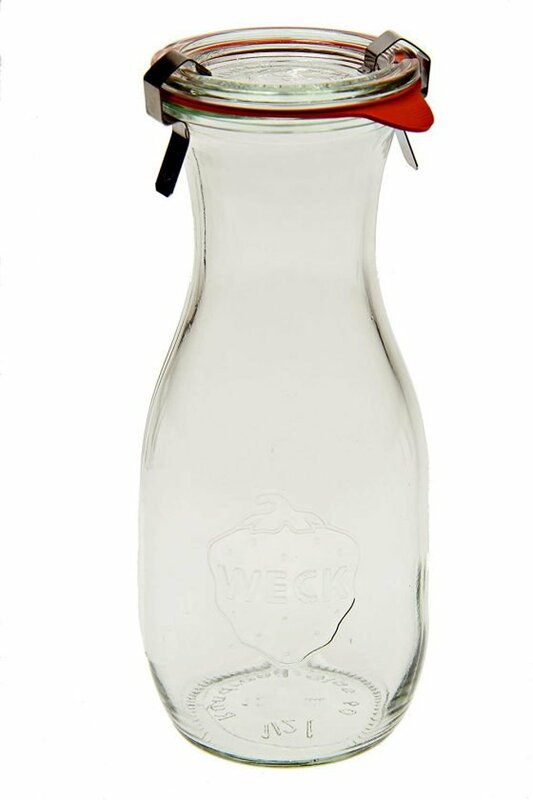 I love these pretty Weck Jars for serving salad dressing. 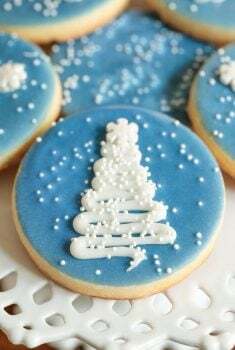 They come with lids, go from refrigerator to table and always look nice. Using a sharp knife, cut about 1/4 to 1/2 inch (depending on the thickness of the peel) from the top and bottom of the orange to expose the flesh. Place the fruit on one of its flat ends and cut down to remove the skin and the white pith. Rotate and repeat, working your way around the fruit until the orange fruit is completely exposed. Slice, dice or cut between the flesh and the white membrane to create orange segments. Place most of the watercress (reserve a small amount) on a large serving plate or platter. Top with sliced fennel, oranges, dried cranberries and pistachios. Drizzle lightly with the Lemon Ginger Dressing. Pass more dressing at the table. 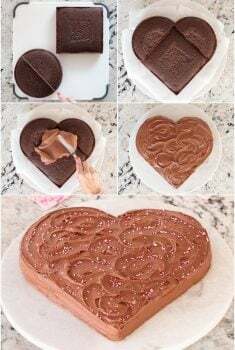 See Café Tips above in post for more detailed instructions. Nutritional information does not include the Lemon Ginger Dressing. See that post of information. I made this salad for about 16. I used both watercress and arugula. I plated it in layers all greens to the bottom, on a large silver serving platter and it looked Beautiful. I drizzled the dressing and just lifted the ingredients to coat. The guests loved the taste and the presentation. Not a drop left. Rave reviews. I didn’t use all of the dressing. 1/2 to 3/4 was plenty for my taste. That sounds wonderful Therese! Thanks for sharing your lovely results! Making this tonite for dinner with Chicken Tikka. Should be the perfect accompaniment!!! Oh yes, that sounds wonderful Sally! Very nice Chris! I have a hard time finding watercress sometimes – but love it. 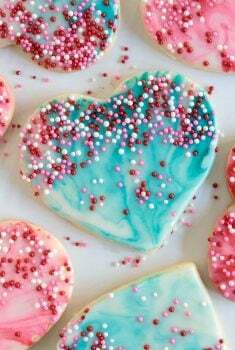 Such a great combination and pretty too. Thanks for sharing – PINNED! I love everything about this salad! My sister made a fennel salad years ago and it was then I discovered how lovely it is raw—and I’m not a licorice fan, either. Can’t wait to try this! Such a lovely winter salad! Thanks Angie! I just can’t get enough salads this time of the year! So refreshing and light!